The most watched inauguration coverage nationwide, Panata sa Pagbabago received a commanding overnight audience share of 39 percent as against the 33.6 percent of ABS-CBN’s Ang Panunumpa: Pangako ng Pagbabago, based on Nielsen Phils. TAM’s National Urban Television Audience Measurement (NUTAM) TV Households data for June 30, 2016. 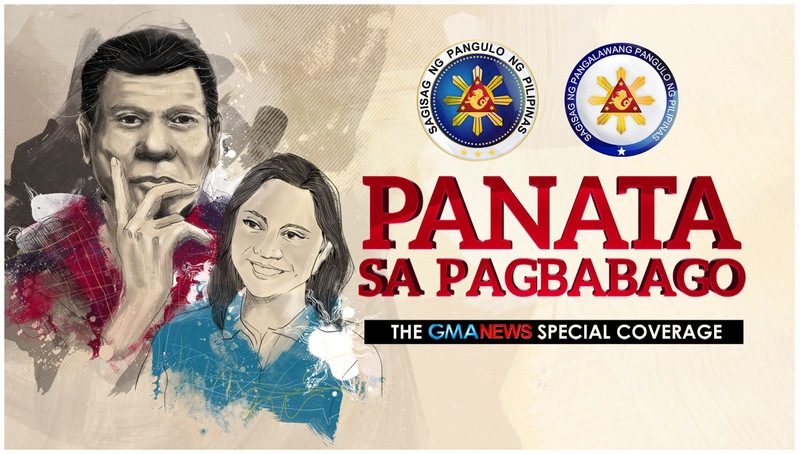 Online coverage of GMA’s Panata sa Pagbabago was also a big success. According to Google Analytics data, GMA News Online received more than six million page views on that day alone, with users taking particular interest in behind the scenes photos, videos, and stories from the Duterte inauguration, as well as the text transcript of the new president's inaugural address to the country. GMA News and Public Affairs’ special coverage of the inauguration of President Rodrigo Duterte and Vice President Leni Robredo – proved, yet again, that the Kapuso Network is the country’s most trusted news source on-air and online during events of national significance. The Panata sa Pagbabago Facebook livestream and archived videos (facebook.com/gmanews/videos), meanwhile, reached a total video views of 1.15 million as of 12 noon of July 1. GMA's coverage hashtag #Du30saJune30 was also the most talked about topic on Twitter here in the Philippines and one of the top trending topics worldwide during inauguration day. Bannered by no less than GMA News Pillars Mel Tiangco, Mike Enriquez, Vicky Morales, Arnold Clavio, and Jessica Soho, the Kapuso special coverage also featured historical and context packages as well as in-depth analyses from special guests outgoing Undersecretary and Officer-in-Charge for the Presidential Communications Development and Strategic Planning Office Manuel Quezon III; former DEPED Asst. Secretary and co-author of the book “So Help Us God: The Presidents of the Philippines and Their Inaugural Addresses” Jonathan Malaya; and De La Salle University Political Science Professor Richard Heydarian.